If trends in pledging of shares indicate the financial health of promoters, India Inc. is showing early signs of deleveraging. 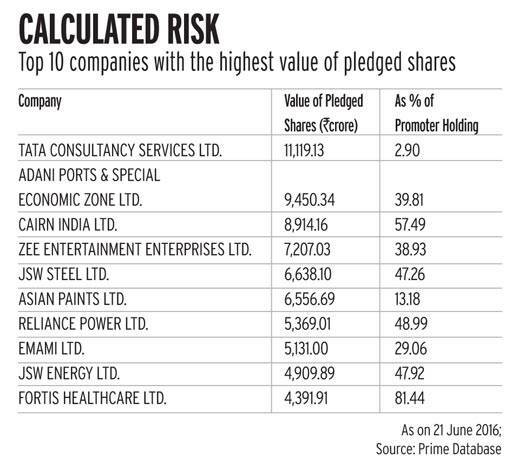 If we look at the data of top 25 companies that account for 58 per cent pledged shares by value, 11 showed a decline between March 31 and June 21. This means the promoters paid the lenders and got a part of their shares released. The list includes TCS, Zee Entertainment, JSW Steel, Reliance Power, GMR Infrastructure and Apollo Hospitals. Seven showed an increase while the other seven showed no change. For instance, TCS saw pledged shares fall from 3.15 per cent to 2.90 per cent. The value fell from Rs 11,490 crore to Rs 11,119 crore. This was despite a 5.2 per cent rise in the company's stock price during the period. "This is an indication of confidence returning to the market. This has seen stock prices of these companies move upwards. The market has seen the cash on balance sheets as a positive sign," says Sanjiv Bhasin, Executive Vice President, Markets, IIFL. However, it's too early to assume that it's a complete turnaround. Between March 31 and June 21 this year, the value of total pledged shares rose 7.5 per cent from Rs 1,81,410 crore to Rs 1,95,056 crore, according to Prime Database. This accounted for 8.3 per cent capitalisation of the National Stock Exchange or NSE. Promoters of 512 companies out of 1,533 listed on the NSE have pledged shares (See Tapering Off). 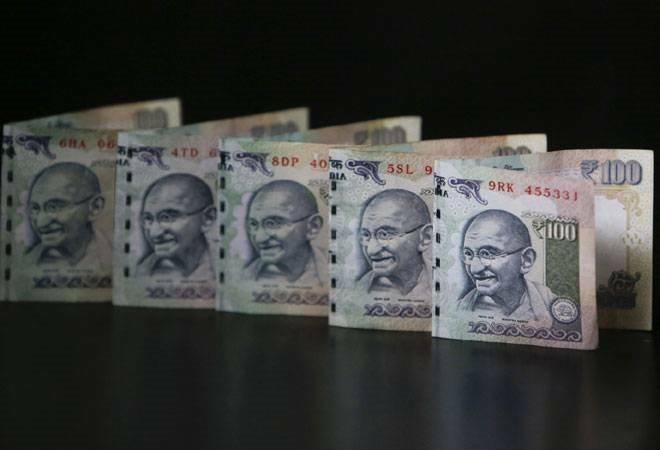 "The main reasons for share pledging are need for cash for retiring debt, business operations or investing," says Ravi Shenoy, Vice President, Motilal Oswal Securities. "The second trend of pledging shares for investing in the market or starting new businesses has also caught on, especially with promoters of mid-cap and small-cap companies," he says. They are feeling encouraged to do this as mid-cap and small-cap shares are trading at a high. Banks, too, are putting pressure on promoters to pledge shares as collateral. "After the United Spirits incident, eyebrows were raised over banks' lending practices. Therefore, they are compelling companies to pledge shares of promoters for loans," says Bhasin. For instance, of late, Zicom Electronic Security Systems promoters have been pledging more and more shares. The company's share price has also been plummeting. When contacted, the company said the rise in pledging has nothing to do with the fall in the stock. Pramoud Rao, Managing Director, says, "We had to pledge shares for a working capital loan. Unlike in the past, when we used to give property as collateral, banks today are asking for promoter shares." The value of Zicom's pledged shares came down from Rs 27 crore on March 31, 2015, to Rs 9 crore on June 21, 2016. During the period, the percentage of shares pledged by promoters rose from 41 per cent to 48.5 per cent. Did the fall hurt? "Fall in the share price doesn't matter in our case. Until we are paying interest on our loan, the fall in the share price doesn't make any difference. The pledging has risen as we have taken more working capital loans from banks," says Rao. Shenoy of Motilal Oswal is worried about the trend. "While banks and non-banking finance companies keep a 50 per cent margin between the value of the loan taken and the value of the pledged shares, they have to be careful, otherwise they will get into a trap. For instance, if a company fails to meet its obligations and the value of its shares erodes, it will be difficult for them to recover money in case of a default." "Pledging of shares is no more a bad word. But it needs to be case-specific. In the past, while the market used to punish companies whose promoters pledged shares, today if it is for a genuine reason, the market rewards the stocks," says Bhasin of IIFL. "While the repo rate and 10-year G-Sec yields are low, borrowing costs for companies are still high. Pledging shares is a safer, faster and cheaper way to get money," he says. "In Gokaldas Export, promoters have pledged 100 per cent shares, but the stock has been a multi-bagger. This is because the company took the money to retire debt. Similarly, sugar stocks have been the best bet in the past one year. 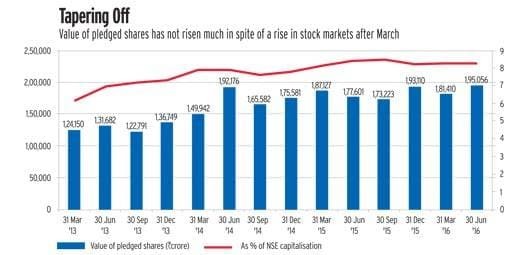 When promoters pledged to buy own shares, it was an indication that they have hit the bottom," says Bhasin of IIFL. However, Shenoy, who is a mid-cap and small-cap specialist, still considers that pledging of shares by promoters is not a good sign. "We usually avoid companies whose promoters pledge shares, but if it is for repayment of debt or capital expenditure we may consider it. If the proceeds are used to play the market, it's a clear no." While the trends may be different between large-cap and mid-cap/small-cap companies, it is comforting to know that some sort of deleveraging is on as the value of pledged shares is stable despite the rise in stock markets.